Wow, an amazing display of opulence. This was a private night tour and included dinner. This was a private night tour and included dinner. It was an interesting way to see it. I littel "kitchy"
One could spend many days visiting St. Petersburg. We enjoyed the tours we chose. On par with the beauty of Versailles. The grounds are also extensive and beautiful. Very interesting tour to Pushkin, a suburb of St. Very interesting tour to Pushkin, a suburb of St. Petersburg where Catherine&apos;s Palace is located. Our guide was informative and the Palace quite amazing! Beautiful place. Especially the Amber room. Again, a terrific one-of-a kind experience, although somewhat akin to Versaille. We enjoyed this tour which included a second palace, a tour of the grounds, former boat house and a few other things. One of the highlights for sure. One of the highlights for sure. Over 150 golden fountains in the rear gardens! 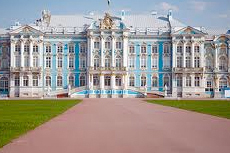 We also visited Catherine&apos;s Palace. Alexandria was the best tour guide we&apos;ve ever had, and we&apos;ve been all around the world. Alexandria was the best tour guide we&apos;ve ever had, and we&apos;ve been all around the world. The palace was interesting and the grounds really pretty. The drive from the ship through town was nice, too. This was a beautiful palace. So much history, great restoration work. We took this tour just to see the Amber Room. We took this tour just to see the Amber Room. We entered early so it wasn&apos;t real busy. I would have liked more time to see the gardens, too. We saw a lot in the two day tour best of excursion. We did not want to spend 2 full days on shore, so we took 2 short excursions that NCL was offering. Must see. The Marble Room is quite possibly the most amazing room you will ever see. Catherine&apos;s Palace was beautiful but very overcrowded. Catherine&apos;s Palace was beautiful but very overcrowded. There was a lot of gold throughout the palace. The tour guide was excellent and the Palace was incredibly beautiful, but very, very crowded. The other highlight of the Russian excursions. The other highlight of the Russian excursions. Here again crowds were a problem. We did not have early entry, but guide was very knowledgeable and got us in quickly. We did not have early entry, but guide was very knowledgeable and got us in quickly. Always a crowd there if you don&apos;t go very early.